Superbowl Sunday morning, I couldn’t think of a better place to be than sitting on the fire escape, watching smoke billow out of our brand new Big Chief electric smoker. D. set a fan in the window to keep the smoke blowing outward, but that didn’t keep the warm smell of hickory from filling the apartment. After about a half hour, I thought I spotted trouble when a police car slowed down and rounded the corner. 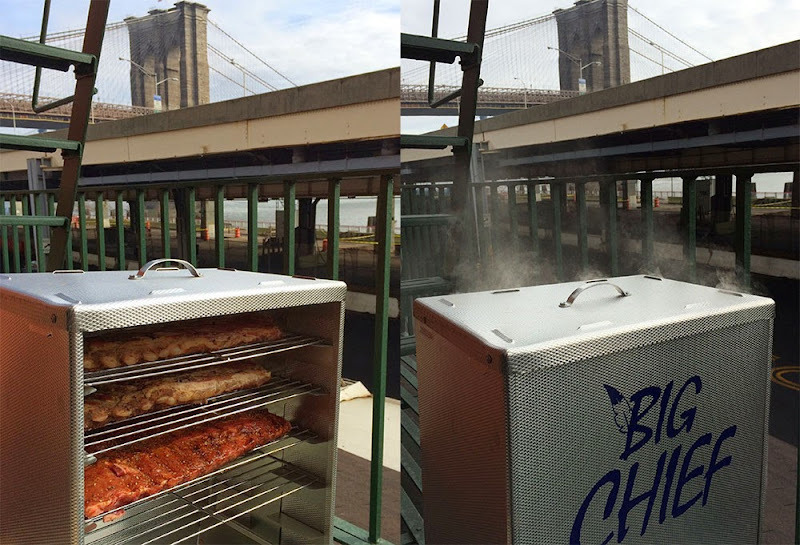 Smoking and barbecuing on one’s fire escape in NYC isn’t exactly, um…allowed. I doused the wood chips and brought everything inside. Ok, so I panicked, and it turned out to be a false alarm. If they had really seen us, they would have made a U-turn and parked it right out front. Duh. 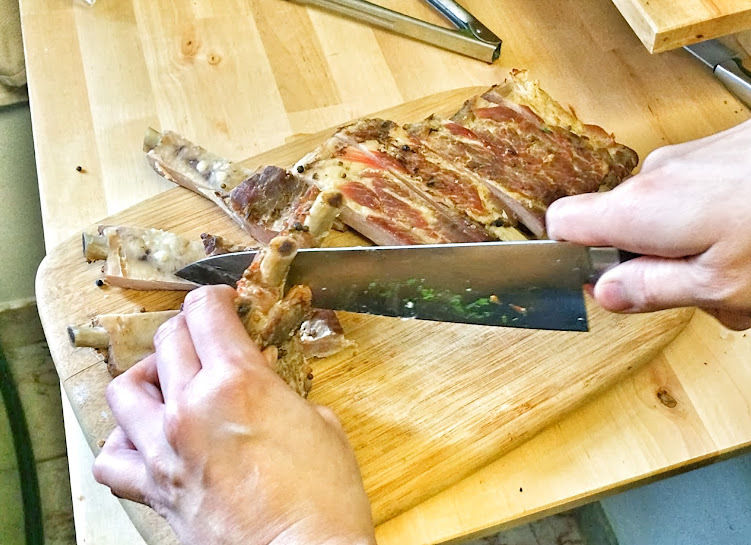 We like a taste test, so I was making ribs two ways. Inside the smoker were two racks of St. Louis style ribs and two racks of Baby Back ribs. The night before, I braised the larger, St. Louis Ribs until they were falling off the bone tender, and allowed them to cool overnight. I rubbed the Baby Back ribs with a dry rub instead and wrapped them to marinate overnight. The next morning I placed the cooked St. Louis ribs and the marinated Baby Backs in the smoker. Even though they didn’t get a full hour like I wanted, the ribs were nice and smoky. From there, the Baby Back ribs finished roasting very slowly in a low oven. Later, I glazed the already cooked St. Louis ribs in a hot oven with barbecue sauce once our guests started arriving. So now for the taste test. Braising the St. Louis ribs meant that the flavor of the spices penetrated all the way through. The meat just fell off the bone, and glazing them in the oven with barbecue sauce gave them a nice caramelized molasses-vinegar flavor. But they didn’t even come close to the superior slow roasted flavor and texture of the Baby Back ribs. These babies didn’t even need barbecue sauce. They were meltingly tender on the inside, and had an aromatic crust of toasted herbs and spices from the dry rub on the outside. It was no contest. The dry rubbed, slow roasted ribs were more like true slow smoked barbecue and blew the braised ribs away. Go Seahawks. If you don’t have access to a smoker, don’t worry. These ribs are just as tender and delicious straight roasted in the oven, and the smoked paprika in the rub will give you some of that campfire flavor you’re missing. 1. Using a spice grinder, coffee grinder, or mortar and pestle, grind the whole spices. Mix thoroughly with the paprika, cayenne pepper, oregano, dark brown sugar, and salt. 2. Rub the spice mix into the ribs. Wrap tightly in plastic and marinate, refrigerated for up to 12 hours. 3. If you have access to a cold smoker, you can first smoke the ribs for an hour. Meanwhile, preheat the oven to 350°F. 4. After the ribs have smoked, transfer them to a roasting pan and place them in the oven, loosely covered with foil. Once the ribs start to release cooking liquid, baste them periodically. If they seem too dry, you can add a little chicken stock and baste with that. There should be enough juices to baste with, but the ribs should not be submerged. If they seem to be burning, lower the oven to 325°. Roast for about 4-5 hours or until tender. This is a good base to start playing with making your own barbecue sauce. I use organic ketchup, which doesn’t contain corn syrup. I also prefer lighter vinegars like distilled, cider, white wine, or rice wine instead of thick or strongly flavored (and expensive) vinegars like balsamic or aged sherry. Choose whatever hot sauce you prefer, and adjust the amount based on spiciness and flavor. Use this as base to add other flavorings too. Bourbon, if you like it boozy, or even coffee if you want a darker richer flavor. Go ahead, have fun with it. Mix together all the ingredients in a heavy bottomed saucepan. Bring to a boil, then lower to a simmer and cook, stirring frequently so the sauce doesn’t stick to the bottom of the pan. The sauce is ready when it is thick enough to coat a spoon. Our go-to recipe for cole slaw, and the perfect complement to these ribs can be found at Smitten Kitchen. You might also like BBQ Wings with Braised Greens and Cole Slaw. Tags: Baby Back Ribs, Barbecue, Big Chief Smoker, Cooking, Electric Smoker, Food, Game Day, pork, Ribs, Slow Food, Superbowl, Technique. Bookmark the permalink. Previous post ← Beyond Kitchen Doors: To Complain or Not? Well done. Smoked ribs are always my top choice. Yours look so tasty!